If you’re affected by cancer, it can be tough on your finances. In fact, research from Macmillan Cancer Support shows that 4 in 5 people affected by cancer are on average £570 a month worse off as a result. Laura was diagnosed with Hodgkin’s Lymphoma in 2011. Due to not being able to work during intense treatment, she experienced financial difficulties. She also found getting travel insurance difficult. She received support and information on benefits from Macmillan, as well as help from her friends and family. “I remember being diagnosed and being told I wasn’t able to work. I laughed in the doctor’s face and said of course I’ll work. A month later and I was off work for nine months. and live with them. I had a flat near my hospital and if I had to move, it would mean I couldn’t get to my hospital easily or might have to have treatment elsewhere. I couldn’t work. I tried to at times, but I was too sick. My brain was like marshmallow. I remember being hospitalised and taking a call from a friend who offered me freelance work and trying to do work from my hospital bed then just giving in. I was staying overly positive and trying to be resilient but looking back I was crumbling. I didn’t work from September one year until May the next, then went back part time. I luckily had a guardian angel in the form of a wonderful person, who at the time, I had never met. They set up a fundraiser and raised enough money for me to live off during the treatment – just enough to pay my bills and rent alongside the state benefits I received. Macmillan provided a grant and helped with wigs at the hospital, as well as advice on benefits. Some of my friends put a fundraiser on. My now husband was my rock – he was there for me throughout. He put every penny he had towards the flat, he moved in to help look after me, drove me daily to the hospital – his work were so understanding and he worked flexible hours around my treatment. My sister’s a clinical nurse specialist, a cancer nurse, and I’d have been lost without her. She would call me daily and always offer advice. I had wonderful friends who would come round and give me injections, keep me company during chemo and just keep my spirits up. They were happy to be seen with me when I looked, quite frankly, ghastly. I’ve now been cancer free for five years and in those five years been fortunate to have a baby. I haven’t experienced any long-term side effects except probably anxiety. Having cancer doesn’t mean perhaps physical side effects to everyone but the mental ones will stay with me forever. 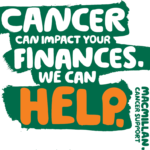 If you’re affected by cancer and have money worries, visit Macmillan for more information.